With a capacity of 10 litres of foam concentrate and the possibility of dosing the UPRIM (portable foam unit) at 1%, once connected to a power source it can generate up to 1000 litres of premixture, i.e. up to 50 m³ of medium-expansion foam. Simply connect the UPRIM to a fire-hose station or a fire engine to instantly have a foam generation system perfect for typical operations: car fire, fume suppression, prevention before welding, etc. Thanks to its rotationally moulded anti-corrosion tank in polyethylene, its stainless steel dip tube and the choice of materials used, the UPRIM is almost indestructible. Depending on the type of operation and foam concentrate injected, the UPRIM can be used either with its low-expansion foam nozzle (for a range between 5 and 10 m) or with its medium-sized nozzle. Specially designed for firefighting, the UPRIM has a 10-litre foam concentrate tank and the extinguishing capacity of more than 40 extinguishers. Easy to use, simply fill it with foam concentrate through its large filling port and connect it to a water supply (fire-hose station, etc.). Its flow rate is 60 l/min. The UPRIM is very robust and rustproof with its indestructible rotationally moulded tank in polyethylene. Reliable and precise with its ability to dose the foam concentrate to 1, 3 or 6%, and ergonomic with its wide carrying case, the UPRIM produces low or medium expansion foam thanks to its two types of rapidly interchangeable nozzles. It is a compact, economical and versatile tool for vehicle fires, suppression of toxic fumes or protection against possible fires in industrial facilities (prevention before welding). 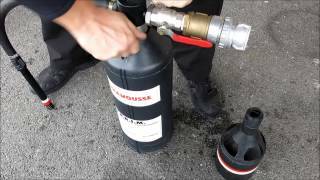 Learn how to fill the tank and how to use the portable foam unit - Leader UPRIM.